Naureen Ahsan, a Pakistani mother, had lent her daughter's Samsung Galaxy J7 (2016) to her four-year old nephew so that he could play a game called "My Talking Tom." Suddenly, the phone got overheated and exploded. Luckily, no one git hurt although "this incident was terrifying for all of us," Ahsan said on Facebook. 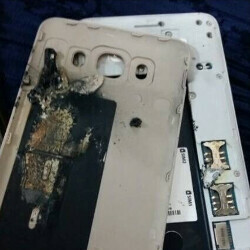 The explosion comes at a rather bad time for Samsung since the company is about to release the Samsung Galaxy Note 7 (FE).